My mother ordered baked Alaska one evening when she and my dad went out to dinner. I remember her telling us about it the next day and how improbable it seemed to my young mind that food could be cold and hot at the same time. We must have begged and begged Mother to make us a baked Alaska because, not long afterward, she made it for us. A pan was covered with white paper and layered with slices of sponge cake and ice cream, (ice cream was usually sold in 1/2 gallon cardboard boxes and it was easy to slice). Last, she covered the whole thing with meringue and put the pan in the freezer. When the time came for it to be served, the creation was placed carefully under the broiler. 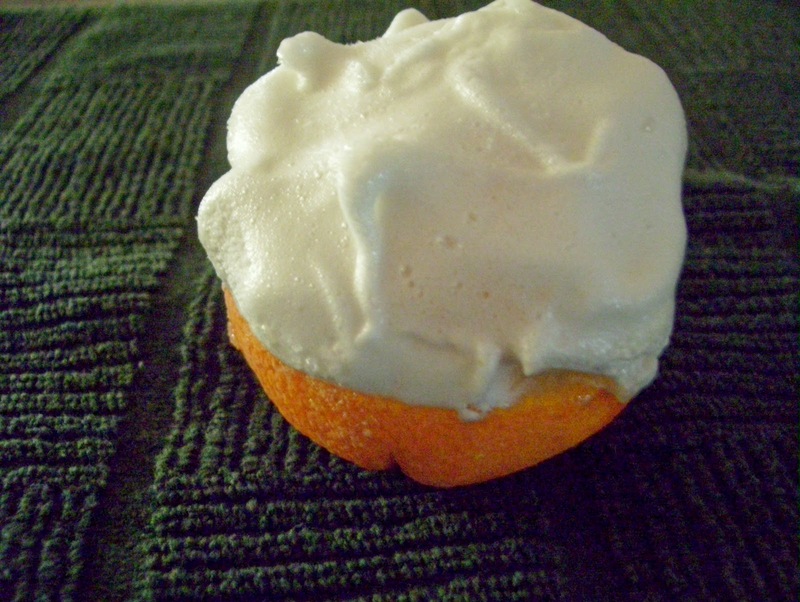 We all watched as the meringue magically browned and at just the right moment, the dessert was removed from the oven. We could hardly wait to see what it tasted like. Slices were placed on our plates and we had our first taste of baked Alaska. It was warm and cold...instead of hot and cold, but that did not matter...it was sweet and wonderful and quite a taste and texture experience. Although baked Alaska was never on our menu again...I never forgot its amazing presentation. 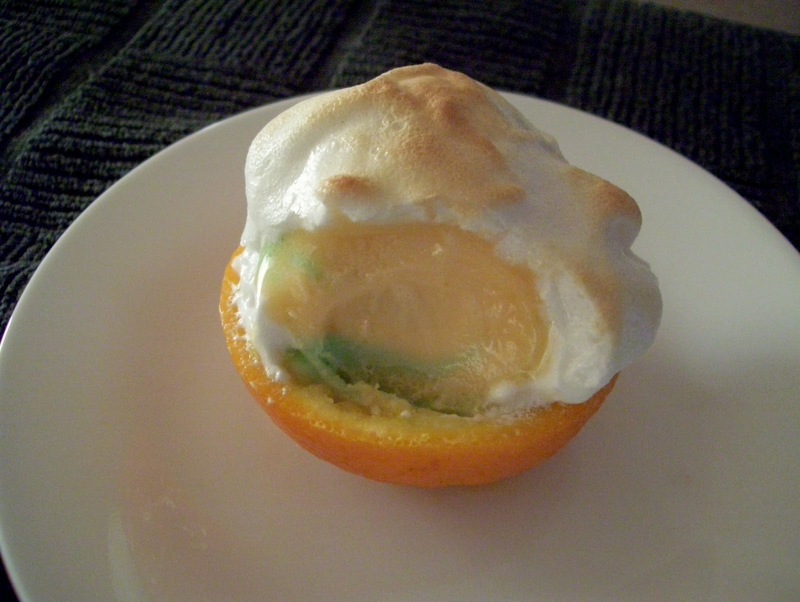 Long ago, as a young mother, I made an easier version of baked Alaska. No cake, no huge quantity to have to consume...it featured sherbet instead of ice cream...we all loved the contrast of temperatures and so it is presented with fond memories. The orange and companion citrus flavors from the sherbet are very refreshing. This dessert is inexpensive, yet would even make a stand-out presentation at a formal meal. 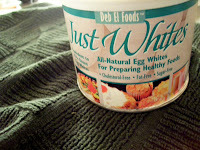 Note concerning egg whites below. Cut thin slice from both the top and bottom of each orange to give each half a stable bottom. Cut oranges in half crosswise; scoop out pulp, and reserve for other uses. *Place a scoop of sherbet in each shell; cover and freeze. Beat egg whites (at room temp) until foamy. Gradually add sugar, 1 T at a time, beat until stiff peaks form and sugar dissolves. Spread meringue evenly over sherbet scoops; freeze until ready to use. The serving pictured on the right was frozen for a month and turned out well. Before serving, place each orange on a baking sheet; Move rack so it is 6 inches from heat source. Select broil. Place little Alaskas in oven and time carefully. Bake for 3 min. or until meringue is lightly browned. 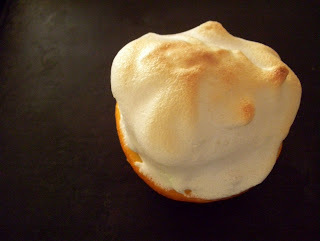 (I checked every minute to make sure the meringue did not burn). 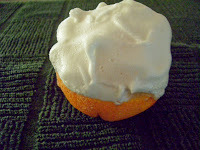 NOTE: Even though meringue has not been a source of any contamination, use only fresh eggs with crack-free shells. Pregnant women, nursing mothers and small children should avoid meringue. Powdered egg whites may be substituted and are safe for all.